From Goodreads ~ An inspiring and humorous celebration of the special bond of friendship. She championed you through your years wearing braces and you calmed her nerves before her walk down the aisle. She advised you on what to wear to land your perfect job and you taught her how to get her newborn to sleep during a midnight phone call. Together you’ve dug through your backyard looking for pirate’s treasure and dug through bargain bins during shopping outings; you’ve shared your secrets, doubts and dreams; and you look forward to conquering hot flashes together. 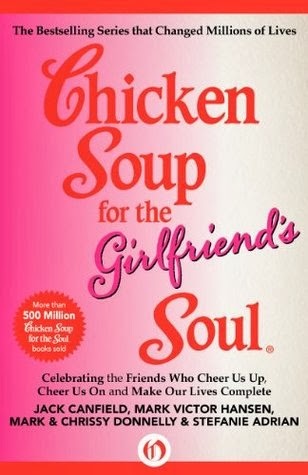 You may have met her in kindergarten or at work, in a playgroup or on the Internet - but if she’s cheered you up, cheered you on, or lifted your spirit, Chicken Soup for the Girlfriend’s Soul is the perfect tribute to that special friend. Whether she’s your lunch companion, your sounding board, your confidant, or all of the above, she anchors you during life’s storms and helps you revel in life’s joys. With tales of finding friends in unexpected places, of strength during life’s toughest challenges, and of forging lifelong bonds and memories, this book will tug at your heart and hers as you celebrate the unique spirit of female friendship. I've read many of the books in the Chicken Soup for the Soul series over the years. Though some of the stories tend to be a bit religious (I'm not), I find the stories in general to be nice and feel-good. There was a variety of stories ranging from when girls met their BFFs in elementary school, high school and later in life. Some stay friends forever while others drift apart but the effect of their friendship remains with them. My mother in law loves those chicken soup books.